Step 1:- The user sends a request to IIS. IIS first checks which ISAPI extension can serve this request. Depending on file extension the request is processed. For instance if the page is an ‘.ASPX page’ then it will be passed to ‘aspnet_isapi.dll’ for processing. Step 2:- If this the first request to the website then a class called as ‘ApplicationManager’ creates an application domain where the website can run. 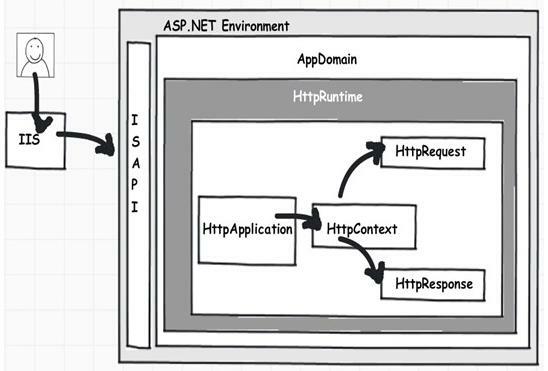 As we all know application domain creates isolation between two web applications hosted on the same IIS. So in case there is issue in one app domain it does not affect the other app domain. Step 3:- The newly created application domain creates hosting environment i.e. the ‘HttpRuntime’ object. Once the hosting environment is created necessary core ASP.NET objects like ‘HttpContext’ , ‘HttpRequest’ and ‘HttpResponse’ objects are created. Step 4:- Once all the core ASP.NET objects are created ‘HttpApplication’ object is created to serve the request. In case you have a ‘global.asax’ file in your system then object of the ‘global.asax’ file will be created. Please note ‘global.asax’ file inherits from ‘HttpApplication’ class. Note: The first time an ASP.NET page is attached to an application, a new instance of ‘HttpApplication’ is created. Said and done to maximize performance, ‘HttpApplication’ instances might be reused for multiple requests. 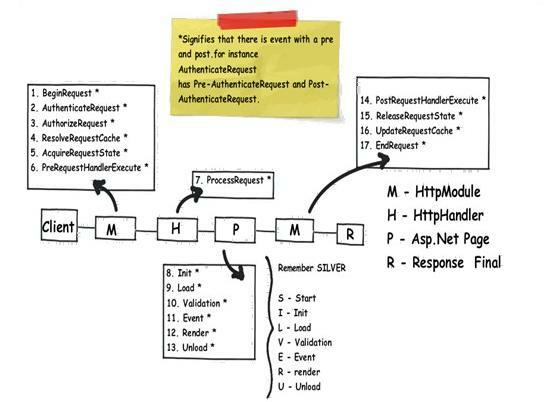 Step 5:- The ‘HttpApplication’ object is then assigned to the core ASP.NET objects to process the page. –ValidateRequest() for validating information sent by the browser to determine whether it contain malicious markup or for Cross-site scricpting attacks. –URL mapping if it is configured in UrlMapping section in web.config.